Oklahoma City Thunder small forward Kevin Durant (35) dunks the ball against Houston Rockets small forward Omri Casspi (18) during the second quarter at Chesapeake Energy Arena. Sunday was the kind of night where the Thunder needed Kevin Durant and Kevin Durant needed a big game. You know, calm the restless masses. Let everyone know it’s going to be OK, at least for now, until Russell Westbrook returns. Durant didn’t let anyone down. Instead, he carried the Thunder. Thirty-three points, 11-of-17 shooting, 13 rebounds in 38 minutes. 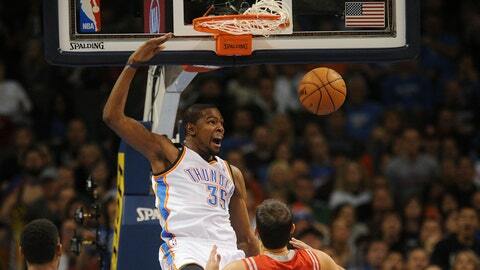 The Thunder beat Houston 117-86 and moved to 2-0 since Westbrook was sidelined once more with a knee injury. 1. There might be some off nights, but Kevin Durant can win games by himself. OK, so you maybe you already had a good idea Durant is one of the best basketball players on the planet, but what often gets forgotten is Durant can carry a team to a win. That fact was lost a season ago when the Thunder fell in the playoffs in five games to Memphis. But on a December night, or a January night, Durant can just decide to take over. He’s that good. I asked the Rockets Chandler Parsons if that was the case with Durant and his answer was simple. "Yeah," Parsons said. "He’s one of the best players in the league." Westbrook makes life easier for Durant. No doubt about that. Westbrook makes basketball easier for everyone wearing Thunder blue, but Durant can carry this team if he has to. It’s a LeBron, Kobe, Michael Jordan thing. Not everyone has the ability. Durant is in that group. And you’re going to notice it a lot more the rest of the way until Westbrook returns. 2. Was Durant extra chatty Sunday? While, Durant isn’t exactly afraid of a solid fist pump or an occasional shout, Sunday Durant was downright demonstrative. He barked at the Rockets’ bench throughout the game, he pulled Perry Jones to the side and gave him a not-suitable-for-repeating pep talk. Even when he went to the bench midway through the fourth quarter, Durant was up and cheering on teammates. Perhaps it was because Houston was in town and his old friend James Harden was here. Perhaps he wanted to show everyone this team would be fine without Russell Westbrook. "There’s something special about the game of basketball," Durant said, shaking off the question about whether he was a bit more motivated to take on Houston. "That’s it for me. I just give it my all, play hard and have fun with it." Looked lIke Durant was having a lot more fun than usual, though. "I’m not one of those guys who can turn it on and turn it off," Durant said of his game. "I just try and keep my intensity at the same level." OK, OK, I give up. Durant is not going to bite on that one, but anyone who saw the game knows there was something special to Durant and his look Sunday. We all are on the same page when it comes to Westbrook’s importance, but if there’s a team who could figure out a way to get by after losing its starting point guard, the Thunder should be able to. Or at least they’re certainly prepared. Remember, a season ago, OKC was still int he same place, only they didn’t have the chance to fiddle with their lineup in the middle of the regular season. When the Thunder lost Westbrook last year, it was in the second game of the first round of the playoffs. Established guard Reggie Jackson as one of the best bench players in the league. Established Serge Ibaka as a legitimate No. 3 offensive threat behind Durant and Westbrook. Gotten Jeremy Lamb enough playing time he can be counted on for quality minutes on a regular basis. Seen Steven Adams turn into a center who will likely be the team’s starter next season. Mixed and matched its bench, getting real minutes from Derek Fisher, Nick Collison, Perry Jones, etc. Jackson was phenomenal again on Sunday. He had 16 points, eight assists and made 7-of-12 shots. Undoubtedly you want Westbrook, but if he returns when the team says â around the All-Star break â the Thunder should be just fine until then. The James Harden trade talk will never go away. Anyone else tired of it? Every time Harden goes off, you hear about it. Every time Kevin Martin has a good game or a bad game, the talk creeps up. And especially if Jeremy Lamb has a good game, like he did Sunday. Lamb had a career-high 22 points on 8-of-10 shooting. Lamb just happened to do it against Houston and Harden, who was dreadful, going two-of-nine for six points. "Fans can take it how they want," Lamb said. "I don’t care what team it’s against. Any time I can play good and help my teammates, I’m going to be happy. Every game I play I want to play well. I love the Houston organization. No hard feelings. I just played hard and knocked down some shots." One person who isn’t surprised with Lamb is former Thunder player Ronnie Brewer. Brewer is now with the Rockets and he said Lamb should continue to get even better. "I think he’s a player who can fit in," Brewer said. "You add him, that’s a dangerous team. Guys who were close to the team know his potential and know what he can do. It’s all about having an opportunity. It doesn’t surprise me that you see a young kid work hard who’s ready when his name is called." Lamb was really good Sunday, but as this season gets closer to the playoffs, you’ll definitely start hearing more and more about the trade that’s now more than a season old.